It’s been a while since I didn’t post some news about the project so far, even if the departure day is getting closer and closer. A little bit more than 1 month before the first trip, I may have some things to settle down, but there has been a lot of exciting news. Let’s do a little recap. The workshops lacked a short and clear presentation (nobody likes Walls of text). Here it is. Remember the Mechanicards, those little cards describing board games mechanisms, skills and material ? Well, they are finally translated in English, so people from all around the world will be able to use them. Feel free to use them as they are on Creative Commons Attribution. You just have to somehow mention me at some point, at least by highlighting the link to my website on the bottom of the cards ! I will put them more clearly on my porfolio as soon as possible, but so far you can download the PDF here. The two first months of the project are going to be everything but what I initially planned. * I’m starting my trip the 2nd of September. My first destination is Auxerre, where a workshop will take place the 3rd. * Instead of reaching Besançon the 1st of September, I’ll be there the 6th to launch the project at the CRIJ. Then workshops will take place several times during the following week in different places (more information later on the post). * I will most likely spend some days in Lille after Besançon. * My next stop is Brussels from the 22nd of September for 1 week. Yes, Brussels – which means I’ll actually travel to 10 countries now. I couldn’t find any structure in Mulhouse unfortunately. * Then I’ll travel to Munich to be up and ready the 6th of October. 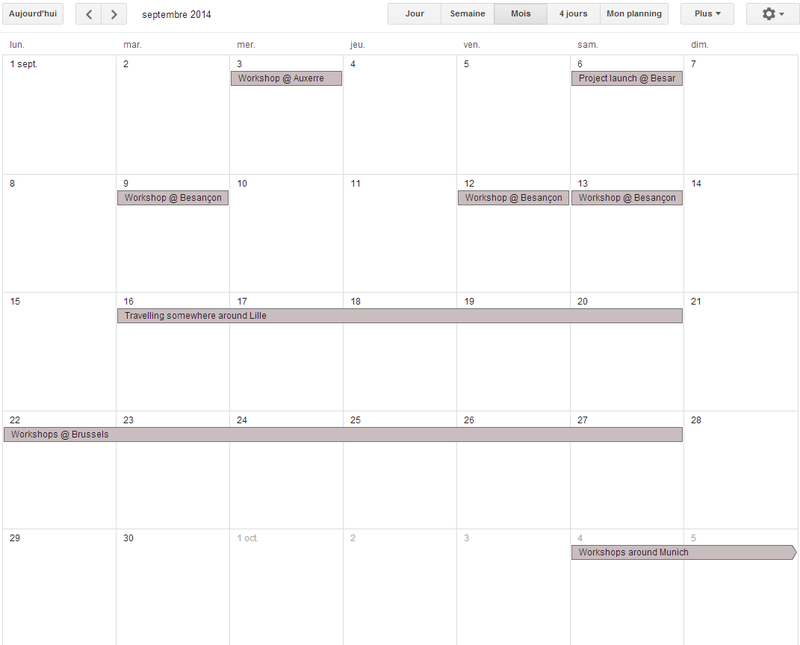 * Finally, I’m going to the Essen spiel festival from the 16th to the 19th of October. Confused ? Maybe a couple of screenshots will help you then ! * Tuesday & Friday evening with the board games association Doubs you play. They are usually playing games thoses evenings, but they kindly accepted that I animate workshops at the same time. They are located here. * Saturday, I’m going to animate a full workshop (playing then creating) at the “Maison de quartier” Montrapon, a place for young people to come and do… fun things. 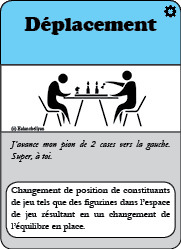 Toutpourlejeu, an awesome company selling board game material, kindly accepted to sponsor the project ! So a pack full of board games material is coming in a few days. I’ll keep you informed (these guys totally deserve a full article). 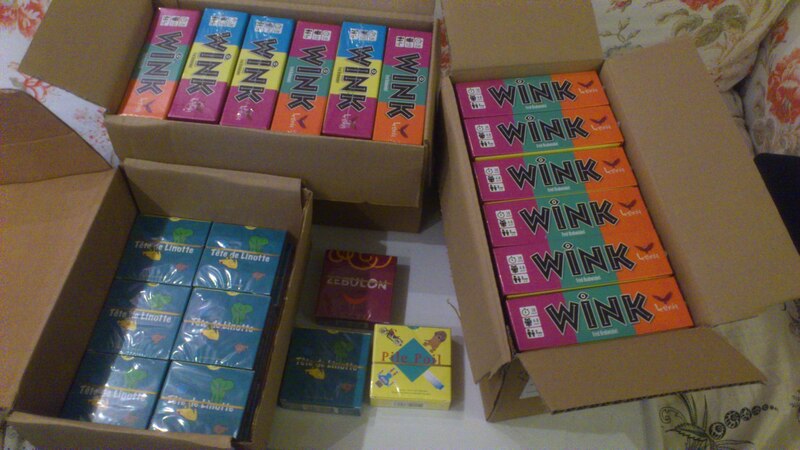 However, I also bought some extra material on Spielmaterial to be able to do some workshops as soon as possible. Some of you may remember the concept of Spotlight : shedding a light on a city I’m planning to set workshops in. So far, I’ve been quite lazy and did only one of them : Innsbruck, the Bridge city ! This may be explained by one simple fact : I wasn’t absolutely sure to go through each city, as long as I didn’t have every structure to host the workshops. Everything could change because in a blink if I had a different opportunity. And this is exactly what happened. I was planning to go around Stuttgart, in Germany, right before Munich. But things have changed, and I’m now actually going to Munich first, then to another city in Germany, named Essen. Let’s have a look at this city ! 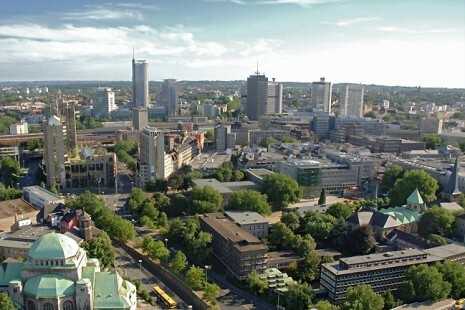 Essen, which may not be one of the best known cities of Germany outside the country, is nonetheless the central part of the Ruhr, which is basically a huge urban area bordered by the Ruhr river (hence the name) and Rhine. 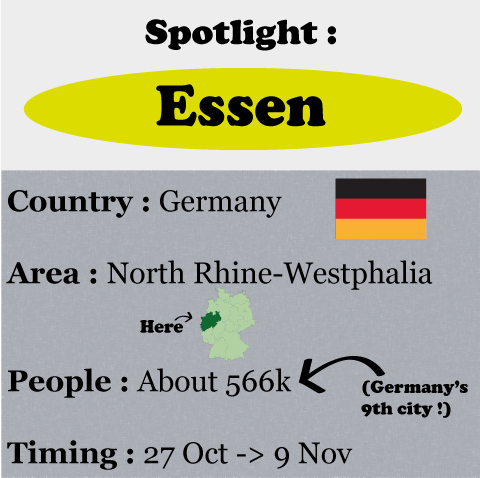 5.3 million people are living in the area, so Essen may play a very central role for quite a lot of people. Couchsurfing-wise, 4,183 people currently have a profile marked as living around Essen. Way to go ! I’m going to Munich to Essen, then I’ll go to Innsbruck afterwards. …Wait. Isn’t that a very ankward trip ? First I’m going from France to the south-east of Germany, then I’m coming back to the north-west, then I’m heading straight to the south ? Does it makes much sense ? That’s right, something very special takes place in Essen : the Spiel festival. Spiel means “Game” (and “Play”) in German, a very fit name for what’s simply the largest board games festival in the world. It takes place from the 16th-19th of October and I will go there to set up some workshops, so I thought it was worth a little change of plans ! Deux nouveaux ateliers à venir (avec des Mécanicartes imprimées) ! Même sans être encore parti sur les routes, les ateliers vont bon train, avec deux nouveaux ateliers prévus la semaine prochaine ! Vous pouvez les retrouver – comme ce sera la cas pour les prochaine – dans le planificateur d’événements à droite. Cette fois, ce soit deux ateliers parisiens qui auront lieu ! – Lundi 30 juin, 19h : une “Micro game jam” de jeux de société organisée par le Gamelier. Deux heures de création de jeux de société en équipe puis une heure pendant laquelle les équipes testeront les jeux des uns et des autres. Un événement intéressant en perspective, organisé par un club habitué à ce genre de manifestations et un véritable désir de réunir des concepteurs de jeux de tout poil. 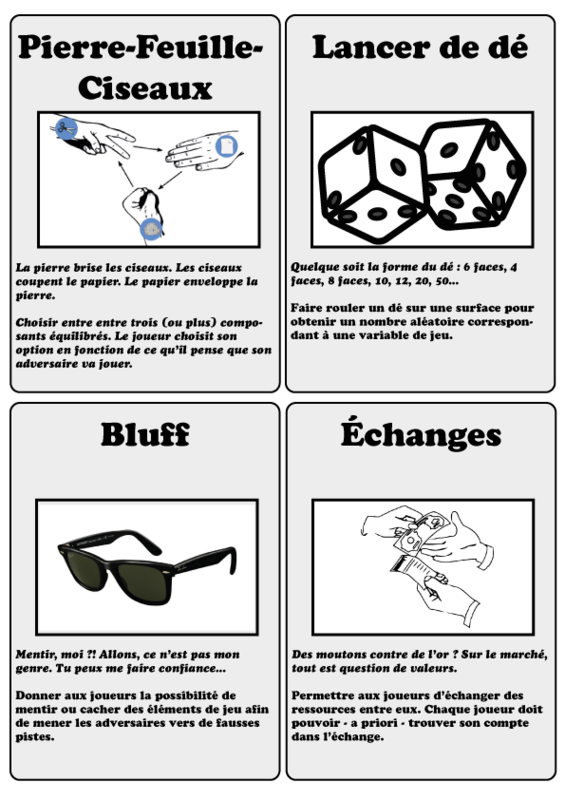 – Samedi 5 juillet, 16h30 : une Nuit du jeu (de 12h !) est organisée par Le Petit Ney, café littéraire et associatif ! Cette structure bien sympathique rappellera peut-être quelque chose à certains, car c’est ici que j’ai pu faire mon premier atelier dans le cadre de Ludi Vojago ! Une sorte de retour aux sources donc, mais cette fois dans le cadre d’un chouette événement où l’on va tous se retrouver autour du jeu. Beaucoup d’autres activités auront d’ailleurs lieu, comme du test de prototypes de jeux de jeunes auteurs ou des animations de l’association Under Construction. Et tes mécanicartes alors ? Une première version cartonnée est enfin prête ! Plus solide et plus pratique que la version papier que j’utilisais jusqu’à présent, elle sera parfaitement adaptée aux ateliers à venir, ainsi qu’aux premiers envois pour les contreparties Ulule. Cette version, toujours en Français, n’est pas adaptée pour les ateliers autour de l’Europe, mais ce n’est qu’une question de temps avant de pouvoir imprimer une nouvelle version en anglais. J’en profite pour remercier Laetitia Di Sciascio pour ses précieux conseils et avis ayant permis d’aboutir sur cette nouvelle version, ainsi que Guillaume Hoquet dont les avis m’aideront sans aucun doute à peaufiner la version définitive avec une grande précision ! Mechanicards – almost ready to print ! Some of you may have heard of the Mechanicards I’m currently making for Ludi Vojago. 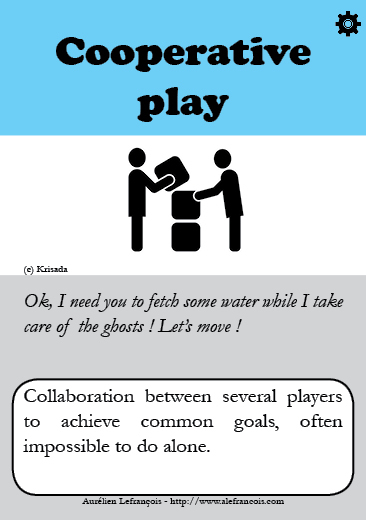 To keep it short, it consists in cards describing board games I’ll use during the workshops. Still in French for now, translation coming soon ! I started those cards a bit more than 1 month ago for the first workshops, and they ended up being quite well received by various people, which made me very happy. Also, some people gave me very useful advice to improve them, both formally and graphically. Here’s one of the first versions ! Now, I’m on the way of printing some sets of cards, as you wonderful people helped me to reach more than 2000€ on Ulule ! I will also leave some sets of cards in the structures I’ll work with during my trip. But reworking them wasn’t actually that easy due to some technical inability ! 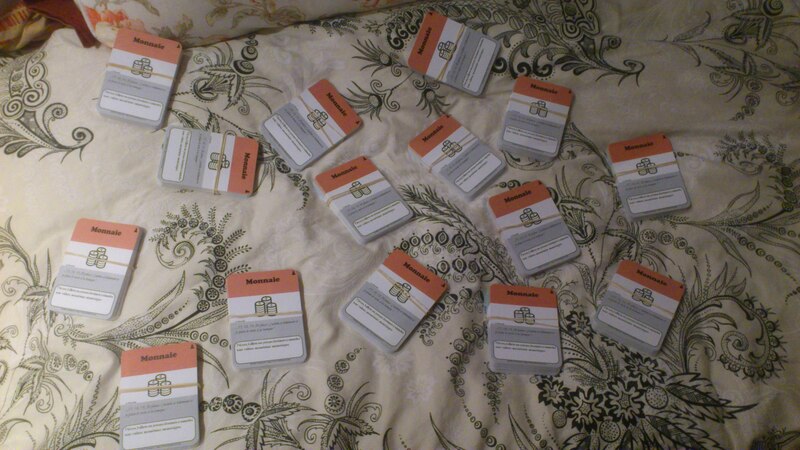 I used a vector drawing software to design the cards, which at the time sounded like a good idea. However, what if I wanted to change something on ALL the cards ? Yeah – I had to change them one by one. You can find the new format on the Mechanicards page. If you have any remark, suggestion, anything… Please feel free to tell me ! Successful crowdfunding and new website ! For starters, I’m delighted to announce that the Ulule Crowdfunding had been successful ! Thanks to the support of 61 people, the project collected 2015€, which means 134% of the initial goal. This, of course, is really awesome, so once again, thank you everybody !! From now on, I will post frequent news on the blog instead of the Ulule page. For the occasion, the website has been reworked ! Some things are still in progress (I’m still not a potent webmaster nor webmaster), but you can already browse what’s new around here. And finally, there’s a brand new Newsletter ! I won’t send you tons of emails, just a couple a month (maximum) to keep you informed of what’s going on around Ludi Vojago. You can subscribe here. Some fresh news… on the Ulule webpage ! This website has been quite silent lately. My apologies to people following the project only on the blog (I believe there’s some of you). However, the project is everything but silent : I’m simply updating the Ulule webpage, and can’t find the time to update this webpage accordingly – which will only last for the following month ! 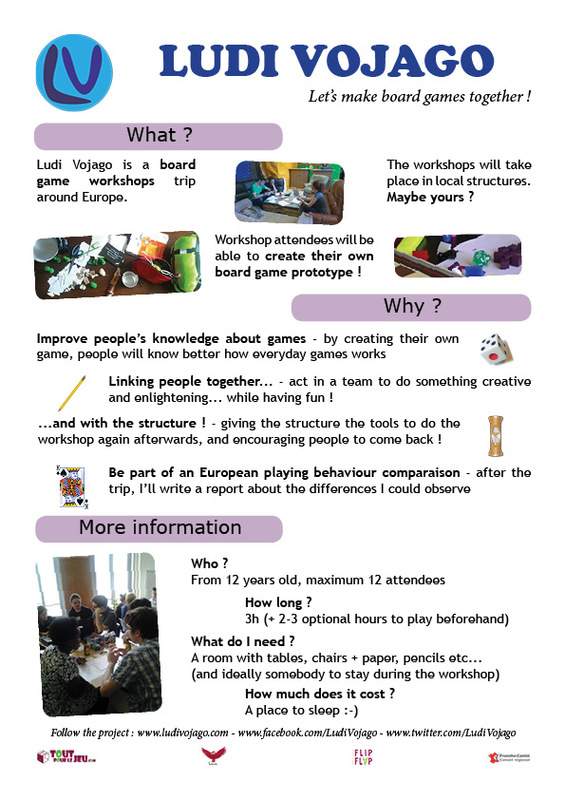 So, feel free to discover the latest news on the Ulule page news section : http://www.ulule.com/ludi-vojago/news/. There’s several exciting things there, including the two first partners and the first workshops which already took place ! Alternatively, you can also follow the Facebook page. Hello everybody ! First of all, allow me to make a small point about the current state of the project. – A first local structure agreed to host the workshops : Die Bäckerei, in Innsbruck, a wonderful cultural and social exchange platform. – The region Franche-Comté is now supporting the project ! Thanks to the local dispositif “Energie Jeune“, a subsidy of 1000€ have been granted for the trip. – After attending the International Festival of Games of Cannes, where I had the chance of meeting several very passionate and interesting people, I’m now planning to go to Lille for the convention Ludinord. If some of you are planning to go there too, feel free to drop me a message ! But wait, there’s more ! As Ludi Vojago is meant to be a trip that people can actually follow, or even participate in some extent (by giving me some advices about directions for exemple), I decided to set up a Crowdfunding web page via the platform Ulule. Now, my goal is NOT to merely ask you for free and gracious money, but rather to establish a partnership between you and me 🙂 Behind this very marketing-friendly formulation hides some actual rewards linked to the trip and/or board games making ! Bonjour tout le monde ! Avant toute chose, voici quelques nouvelles de l’état actuel du projet. -Une première structure locale a accepté d’héberger les ateliers : il s’agit de Die Bäckerei, un chouette centre d’échanges culturel et social à Innsbruck. – La région Franche-Comté soutient désormais Ludi Vojago ! Grâce au dispositif Energie Jeune, une subvention de 1000€ a été accordée au projet. – Après avoir participé au Festival international du jeu à Cannes, où l’occasion s’est présentée de faire un grand nombre de rencontres très enthousiasmantes, je me dirige maintenant vers la convention Ludinord à Lille. Si quelqu’un souhaite me rencontrer et discuter avec moi, n’hésitez pas à me laisser un message ! Mais il y a encore mieux ! Ludi Vojago est conçu comme un voyage participatif. Vous pourrez suivre mon périple en ligne via le blog et les réseaux sociaux, voire même interagir avec moi pendant mon trajet, par exemple pour me donner des idées de lieux à visiter. Pour ces raisons, j’ai décidé de mettre en place un financement participatif via la plateforme Ulule. Mon objectif n’est PAS simplement de vous demander un acte mécène, mais plutôt de créer un partenariat entre vous et moi, par le biais de récompenses liées à mon voyage et/ou à la création de jeux de société ! And here comes a new category of posts : the Spotlights ! My goal is to share some very basic knowledge I have gathered about the key destinations of the trip. But I have to start searching somewhere, and “WHOLE COUNTRIES” is a bit too large. So, after deciding the key points of my itinerary, I’m currently searching places to be hosted around big cities. I take the cities, find out what’s going on there, then search in the smaller towns around, say, a radius of 50kms or something of sorts. But as I’m considerating passing by those cities, better do some homework about them, right ? I don’t know most of them, so I only gather minimal knowledge meant to be completed (or totally discarded) by actually going there. 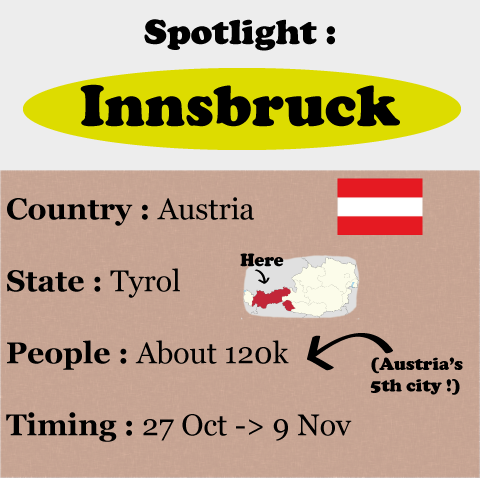 Let’s start with Austria, and the city of Innsbruck ! 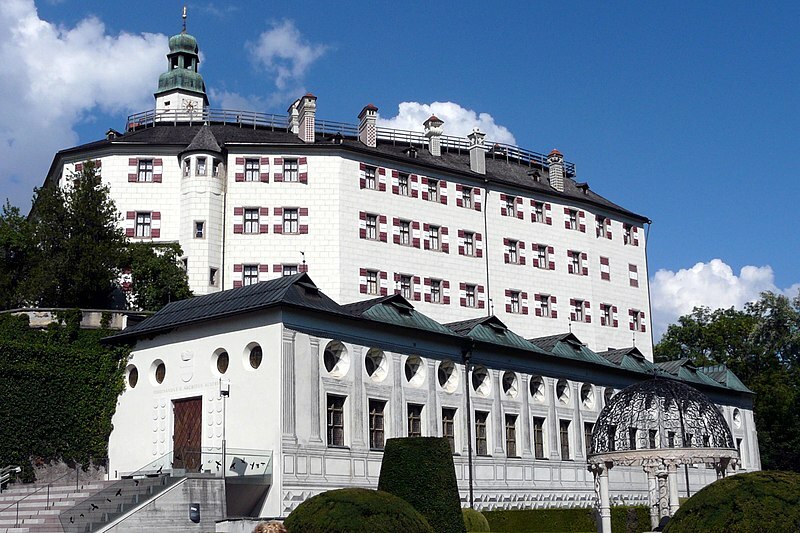 Innsbruck, actually meaning “The bridge over the Inn River“, is a city close to mountains. By “close”, I actually mean “very very close”. The city is between München and Verona, two other cities I’m planning to visit. Couchsurfing-wise, 1,974 people currently have a profile marked as living around Innsbruck, which is not bad at all :-). About games : there’s a café full of board games in the city, the Café Weli. There’s also a video game studio, Still Alive Studios. Also, the city is quite touristic, and it’s quite easy to see why by looking at some pictures of local buildings.